Hospital Manager and Veterinary Technician Leah Ames has been with Driftway for the past 20 years. She's driven not only by her compassion for animals but also by the human relationships that she's created during her time here. "I have made some great friendships over the years with clients and I can honestly say my co-workers are extended family," she said. Leah is also an instructor at Upper Cape Cod Regional Technical School where she teaches an Adult Education course on Veterinary Assistant Basics. She spends time with her husband and son, and she also cares for her rescue dog Duke. 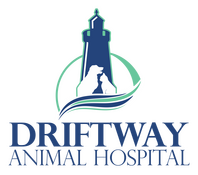 Christine Decato has been a Veterinary Technician with Driftway since July of 2011, but has been working professionally with animals for the past 10 years. Her experience includes working at the small animal ICU at the University of Tennessee Veterinary School and as an emergency technician in Knoxville. Christine is great at assisting the doctors, administering vaccines, checking vitals and monitoring anesthesia. She has a B.S. in Animal Science with a concentration in Pre-Veterinary Medicine from the University of Tennessee. Christine has two companions at home, a ball python named Rosie and a mutt named Francis. Receptionist Erin Stornaiuolo has been greeting our clients and their pets since September of 2006. She spends some of her time away from the Hospital with her Boston Terrier named Benny. Erin enjoys spending time with her husband and children, as well as camping, photography, walking and hiking. Technician Angie Walsh has been with us for the past 17 years. "We are a real family here and our clients are the best," Angie said about the environment at Driftway. "I really love and enjoy working here." Angie has a two cats and a guinea pig at home. She enjoys spending time with her son Shane and heading off to the beach.